The academic world has changed a lot over the passed decade which has resulted in the deteriorating status of the researchers , a lot of work-related stress (PhD stress), and mental health issues for people working in academia ,. According to study , 47% of the PhD students in Berkeley reached the threshold for being depressed, and according to study , 40.81% of the PhD students in Flanders, Belgium felt under constant strain. Compared to highly educated professionals or students, people with a PhD or PhD students report much more mental health issues ,. Feelings of being powerless, helpless, stressed, depressed, unhappiness, and being unable to enjoy every day activities are common among people working in the academic field. On top of that, low self-esteem and perfectionism are common among academics . 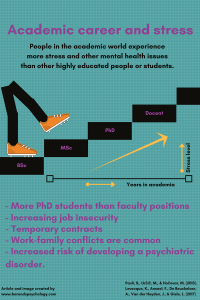 Job insecurity, temporary contracts, too many PhD students and too little faculty positions, and changes in the funding policies are some of the contributing factors to more PhD stress ,. The biggest problem for most people working in the academic world is that they can’t do anything about these contributing factors: you join the rat race or you’re out! Fortunately, PhD stress and the chance of developing mental health issues can be reduced to a minimum with the tips on this page. This article focuses on PhD stress, its causes and ways to reduce the experienced stress levels. 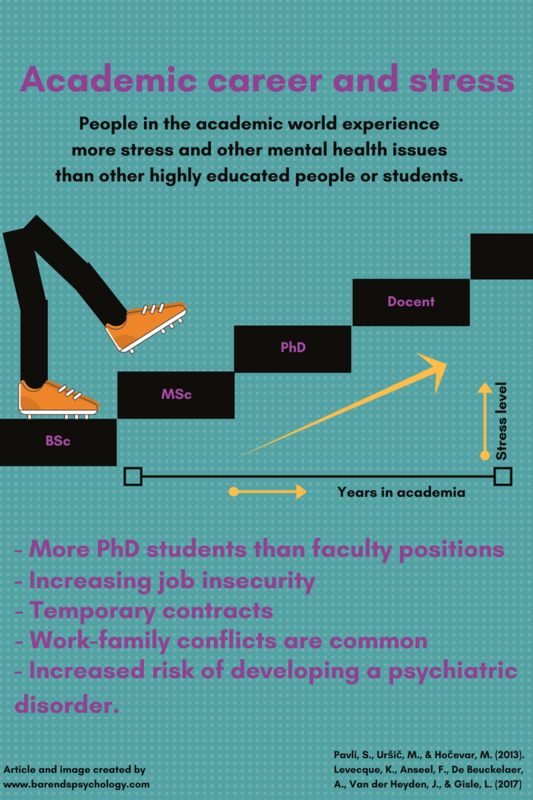 PhD stress – Why do PhD students experience so much stress these days? Future perspective: poor promotion/job prospects; temporary contracts ,. Personal life: work-family conflict & family-work conflict ,,. Work context: supervisor’s leadership style; job demands; job control ,,,,,. Personality and mental health . Due to the economical crisis worldwide, many universities and research institutes are experiencing financial problems, because governments have been cutting in the funds for education for years now. Less funding leads to fewer (permanent) job positions or promotions, less money for research, and an increase in job insecurity and short-term contracts ,. Most research institutes and universities are forced to apply stricter criteria in the allocation of research funds. In some countries, research funds can only be obtained by universities and research institutes if research proposals are accepted by international funding commissions . The cuts in funding can also be seen in the reducing amount of available job positions or promotions; people with a permanent job prefer the security the job gives them over the new challenges they face with a new (temporary) job. 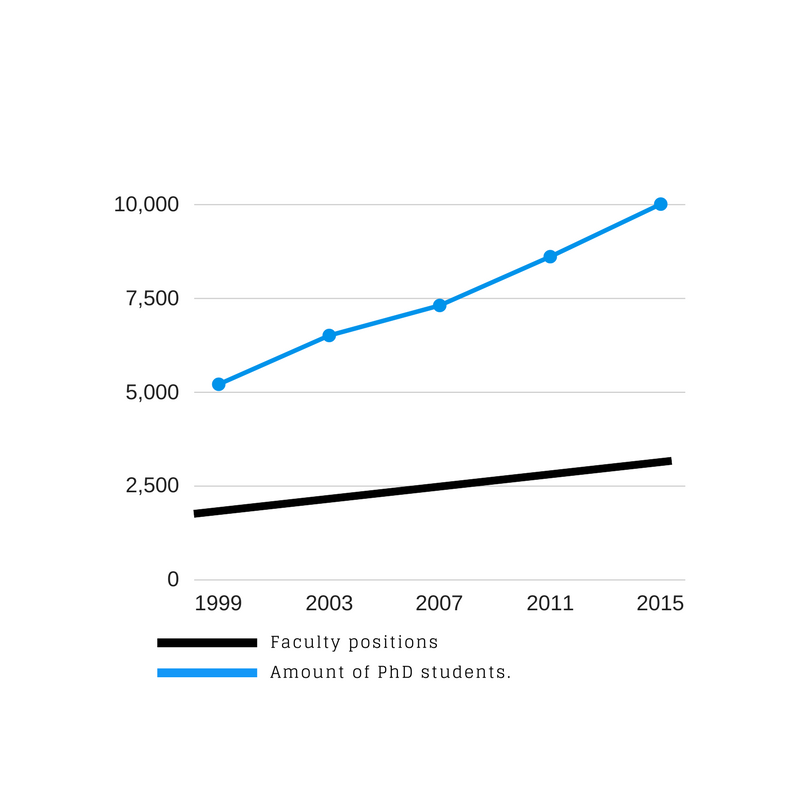 On top of that, the amount of PhD students has increased significantly over the past decade, whereas the amount of faculty positions has only slightly increased (see image) over the past decade . More PhD students for few positions leads to more competition and PhD stress. 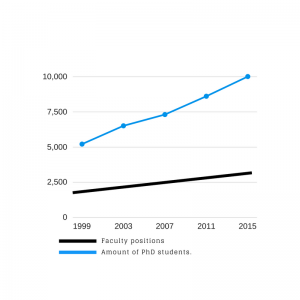 The increasing amount of PhD students in combination with the poor job/promotion prospects has created a huge pool of unemployed people with a PhD. In short: less money for research and education has lead to more short term contracts, poor promotion/job prospects, more unemployment, more competition, and too many highly educated people (PhD students or higher) compared to the amount of positions available. Consequently, this leads to a lot of PhD stress. A lot of PhD students or people with a PhD work in the evenings and weekends due to the high workload, which negatively affects their social life (missing out on family time, parties, and date nights with partner). This is a clear example of work-to-family interference. Both work-to-family and family-to-work conflicts are associated with psychological distress , job dissatisfaction, and burnout among employees in a range of occupations . A possible reason could be the negative sanctions (at both personal and institutional levels) academic scientists face when family interferes with work . 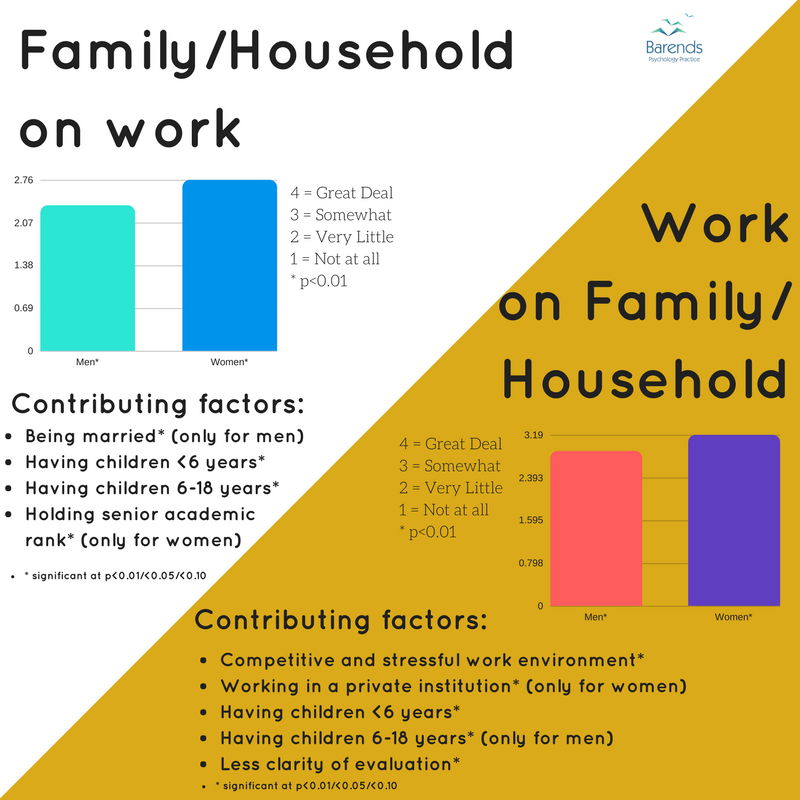 Unsurprisingly, if the departmental climate becomes more competitive and stressful, the probability of work-to-family conflict increases significantly . These circumstances will add to the PhD stress most academics experience, especially if nothing changes. The supervisor’s leadership style has a significant effect on its employees ,. 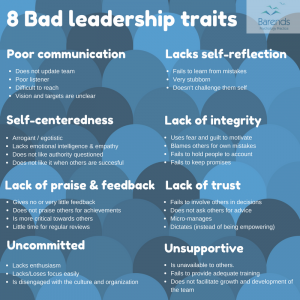 In academia, there are roughly four noteworthy leadership styles: transactional, laissez-faire, democratic, and transformational leadership style; the last two being the most effective ones . Transactional and laissez-faire leadership styles often lead to job dissatisfaction, less productivity, and psychological distress. Transactional leaders tend to focus on employee compliance, task completion, and task-oriented goals. Furthermore, transactional leaders use organizational rewards and punishments to influence the employees’ performance. This often leads to job dissatisfaction and less productive employees . A Laissez-faire leader gives the employee all the freedom, rights, and power to make decisions. Guidance and support are only offered upon request. Laissez-faire leadership is considered to be the least-effective of all, where bullying and psychological distress is prevalent . A transformational leadership style, on the other hand, is based on charisma, intellectual stimulation, and individualized consideration. The transformational leader motivates subordinates by applying higher ideals and moral values . A democratic leadership style is based on democratic decision processes and input from every subordinate. A democratic leader encourages its team to share ideas and opinions, rewards creativity, which leads to more engagement from its employees. Naturally, transformational and democratic leadership style are the most effective leadership styles. 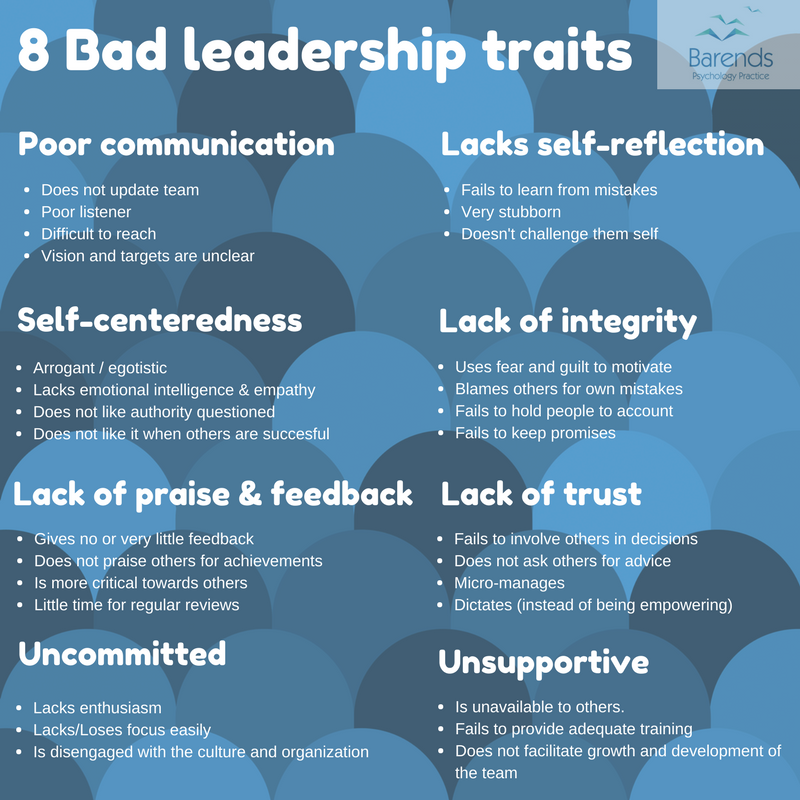 Unfortunately, there are still enough supervisors and ‘bosses’ in academia or the research world that prefer either a laissez-faire or transactional leadership style. Stress has a negative impact on leadership styles. When a supervisor experiences a lot of PhD stress, their leadership qualities deteriorate, which leads to higher levels of stress and burnout in their subordinates . Also, destructive leadership is associated with counterproductive work behaviour and a negative attitude towards the organization in subordinates . In other words: reducing PhD stress by applying changes on an organisational level can be effective if organisations focus on leadership styles and job demands and job control. There is a strong relationship between high job demands and emotional exhaustion and depressive feelings. Job demands are those physical, social or organizational aspects of the job that require sustained physical or mental effort . High job demand and low job control is associated with increased PhD stress. Job control refers to control one experiences regarding the timing of breaks, usage of skills, and working pace . High job demands, low job control, and certain leadership styles in combination with fewer (PhD/permanent) positions in academia creates a PhD stress cocktail so lethal that it’s almost impossible to sustain a health work-to-family life where weekends and evenings can be spend with family. Some people are more sensitive to stress than others. Certain personality traits such as neuroticism, disagreeableness, and tendency to perceive hostility can all lead individuals to be more reactive to stress as well as to perceive the behaviors of others in a hostile manner . Also, suffering from PTSD, anxiety disorders or mood disorders can increase stress levels, because these mental disorders negatively affect daily life and work performance. What can you do to reduce PhD stress? An unhealthy day/night rhythm can cause all kinds of changes in peoples’ behaviour and mood. In general, sleep disturbance impairs quality of life. Compared to good sleepers, people with chronic sleep problems experience more psychological distress and impairments in daytime functioning . People who experience sleep disturbances (or nightmares or insomnia), for instance, have significantly more suicidal thoughts and behaviours . And right before people experience a manic or depressive episode, they report sleeping problems . Therefore, it’s important to keep a healthy day/night rhythm: use the bed(room) only for sleeping; sleep a minimum of 6,5 and a maximum of eight hours a night ; switch off electronic devices one hour before you go to bed; develop a bedtime routine (brushing teeth, taking a shower, read for 10 minutes, turn off light); immediately leave the bed when you wake up (no snoozing). A healthy lifestyle both prevents and reduces the amount of stress one experiences . People who’ve adopted a healthy lifestyle, pay attention to their nutrition, are more in touch with nature, exercise and relax regularly, and possess stress management skills and/or meditate . Exercise and meditation do not only reduce the amount of stress one experiences, they also help reduce symptoms of anxiety and depression . At the same time, both meditation and exercise force you to take a mental break from work/study related activities, and give you time to recharge mentally again. Paying attention to good nutrition indirectly affects the stress levels one experiences, because it prevents people from eating too many calories, and to eat healthy and varied. Obese people are at higher risk of developing depression; the odds increase for severely obese people . Herbal and nutritional supplements such as kava, passionflower, Lysine, and Magnesium help reduce symptoms of anxiety , and thus add to the reduction of PhD stress. NOTE: Next to taking in anxiolytic ingredients, users of passionflower and kava may also consume ineffective of possibly toxic substances . Therefore, it’s important to discuss the intake of herbal medication with your General Practitioner. Avoid (too much) coffee and alcohol. Although coffee has a stimulating effect on people, on the long run people can get dependent on caffeine with means that they need more caffeine to experience the same stimulating effect as before. Unfortunately, regular caffeine and alcohol intake leads to feelings of fatigue and tiredness. Visiting a therapist or counselor when someone feels emotionally or physically exhausted, also known as burnout, or depressed, suffers from symptoms of anxiety or has self-esteem issues is highly recommended. Sometimes, people cannot get better on their own and need a professional to treat or guide them through this process. It is possible that work or study is so demanding that it exhausts you mentally or physically, which increases the chance of developing a mental disorder or symptoms of mental disorders. Sometimes, (old/childhood) traumatic experiences resurface or get triggered, which can lead to sleeping problems, irritability, flashbacks, numbness, and eventually reduce the productivity levels needed to perform at work or for study. For others, low self-esteem may cause a lot of PhD stress, because they constantly question their own academic (writing) skills and are afraid to make mistakes. This may result in perfectionism and perfectionism leads to more worry and rumination about work . Worry and rumination add to stress levels. People working in academia may experience a lot of work-to-family and family-to-work stress  due to job demands and family obligations. A lot of the problems within families are caused by self-centeredness: the intense desire to achieve desired goals and little tendency to satisfy the others’ needs . Although there is no relationship between communication skill level and marriage satisfaction , there is a relationship between marriage satisfaction and conflict resolution: a domineering, authoritarian or autocratic control of the conflict leads to less marital satisfaction and longer lasting conflicts . Due to this approach, partners are less likely to adjust to their partner’s needs and competition and feelings of jealousy between them grows . Knowing in advance what someone’s schedule is, prevents surprises, conflicts, and increases the likelihood that the partner will adjust their schedule a little. A family calendar is very helpful for those who have a busy schedule and have children. People can plan events and deadlines way in advance and it reduces the experienced PhD stress significantly. It is common for people in academia to work on articles for hours at once, because they need to get into a flow (increases their productivity). Unfortunately, writing/working for hours without a proper break is exhausting on the long run, and makes people less emotionally available (which leads to more conflicts at home). Consequently, people become less productive which will lead to longer writing shifts. Therefore, it is important to have regular breaks of 10 minutes, and to have one big break of one hour around lunch time. Exercise, relax or socialize with friends in the evening. This will help you recharge your battery for the next day. Having a support network moderates the effects stress has on psychological distress and significantly improves quality of life . Also, a support network is a strong predictor of a person’s physical health and wellbeing, and helps people cope with phd stress. Intimate social relationships, rather than family relationships, is the strongest predictor of overall life satisfaction . Temporary contracts, less funding for research, too many people with at least a PhD (compared to the amount of positions available), and a strong competitive field, significantly reduce the chance that one will finds a PhD position or job in their desired field. Add the fact that switching careers is considered a failure (because you were not good enough), and it becomes clear that this may be the most difficult piece of advice to follow-up on. Unfortunately, it’s a fact that most people who do their PhD will not end up working in academia, or will have to live from temporary contract to temporary contract. Especially the latter adds to the experienced PhD stress. Make sure you have a back-up plan. Discuss with family or friends how long you will try to get (a) a PhD position or a permanent position in your desired field, before switching to plan B. Discuss what plan B will be and make sure that you like plan B, and that finding a job is easier with plan B. Communicate with your supervisor/boss to know what he/she expects of you and to keep them updated about your progress. Depending on your boss’s leadership style and personality, it is likely that you boss will not ask too much of you when he/she knows how much you have to do still.